A few weeks ago, we shared with you two video tutorials to help you set up your classroom newsletter and today we are introducing you to this excellent resource of templates to use not only for your newsletters but also for your PowerPoint presentations, charts and diagrams, PowerPoint maps, Word templates, vector clip art, business cards, and brochure templates. Powered Templates is one of the most popular providers of professionally made templates that you can use for a variety of purposes. 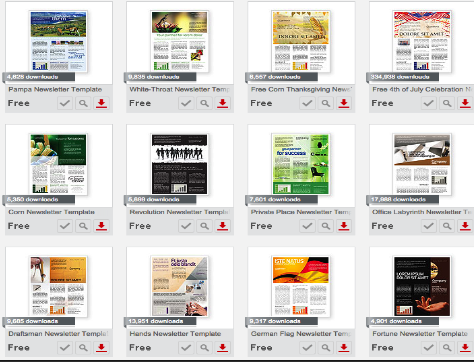 While some of these templates are not free, there are, however, over 40.000 free templates to choose from. The templates offered by Powered Template are arranged into different categories. Use the left hand bar to search for free templates in each category. To download any of the templates you will have to register with the site. Registration is free. This section includes some of good free PowerPoint templates. This section features free Word templates. This page contains some interesting free templates to use for your newsletters.